Departing Batley trio Shaun Ainscough, Alex Rowe and Joe Chandler have paid tribute to the unique Bulldogs family and have thanked fans for their support during their time with the Mount Pleasant club. Ainscough has called time on his Bulldogs career and recalled playing at a packed Headingley Stadium when Batley met Leeds Rhinos in a historic Middle Eights clash as one of his Bulldogs highlights. In an emotional statement to fans, Ainscough said: “I spent the best four years I could have asked for in the Batley jersey and had some unforgettable moments. “Thank you to Complete Serve Ltd and to Mark and Hayley Wells for taking me in and giving me a job when I joined Batley. “It is a special club that I felt welcome from the backroom staff and players. “(Thanks) also Matt Diskin for helping me fight my own personal demons. “I wish the guys and the fans all the best for the future and I love you all. Rowe played the last of his 163 games for the Bulldogs against Swinton, before joining Newcastle Thunder next season, and he was given chance to kick the final goal of the match to wrap up a 40-6 win. Rowe said: “I can’t speak highly enough of the club, the coach the lads and the fans at Batley. All good things come to an end and there have been some fantastic moments. 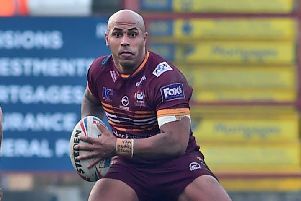 Chandler confirmed he is calling time on his career and said: “I’d like to say thank you to everyone who has made my, and more importantly, my family welcome wherever I have played but especially the people involved at Batley. “It’s been an absolute pleasure to be around the club and I feel lucky to have been able to play there for five years. Two more players who are leaving Batley are player of the year and leading try scorer Brad Day along with fellow forward and coaches player of the year James Harrison, who have confirmed they have joined Featherstone Rovers for 2019.